Jimmy and I celebrated Valentine’s Day a little bit early this year! First, over the weekend we exchanged gifts and cooked a special dinner. Guys, I’m so spoiled. Jimmy is making a new bed for our bedroom! Here’s the inspiration (from Pinterest). Here’s what Jimmy has done so far! This husband of mine continues to amaze me every day. Not only is he talented and hard working, but he’s incredibly sweet. My phone’s battery has been on its last leg lately, so we went to the Apple store together on Saturday to get a replacement. The battery replacement went well, but my camera didn’t work after we got my phone back. I had to pet sit on Sunday afternoon, so Jimmy took my phone to the Apple store to have it fixed (Apple ended up giving me a new phone because they couldn’t fix it!) and he filled my truck’s gas tank. Love him. Jimmy also spoiled me by saying he wanted to take me to my favorite local Chinese restaurant on Monday night. 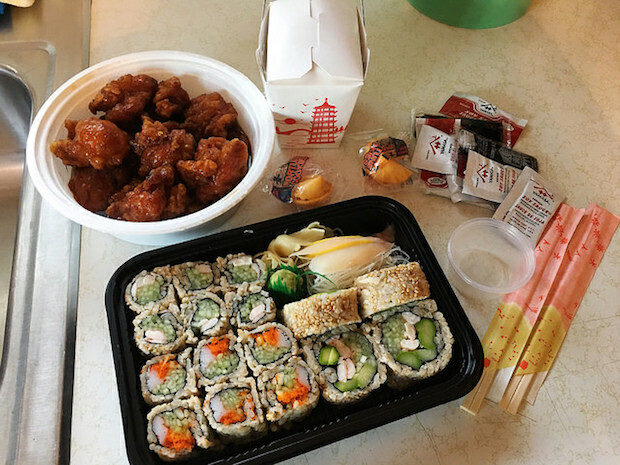 I ended up feeling really awful and flu-ish on Monday, so we had our food delivered and it was so delicious! Jimmy had the General Tso’s chicken and I ordered a variety of sushi and sashimi. 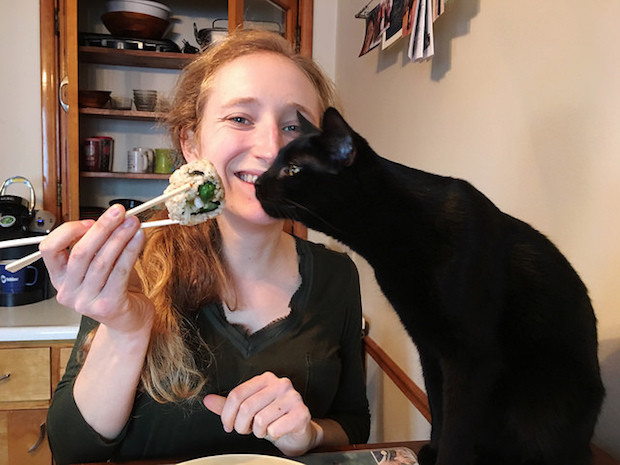 Want to know what happens when you eat dinner and your cat has no boundaries? Yeah, Malcolm sits on our table while we eat dinner every single night. It’s probably (okay, definitely…) totally unsanitary but we can’t stop him. Malcolm gets what he wants or we get scratched/bit. We are owned by our cat, LOL. I made Valentine’s Day dog biscuits in the shape of hearts and bones for all my clients and had pictures printed of their pups as little gifts to give out this week. I used my tried and true honey cinnamon dog biscuit recipe and the clients who have received their gifts said their dogs love the treats. Yay! Speaking of dogs, want to hear a gross/funny story? Mavis pooped on mine and Jimmy’s bed one evening last week (ugh) and I picked up the poop with a paper towel and wasn’t even thinking when I flushed it down the toilet. I totally forgot paper towels can’t be flushed down the toilet and ours immediately clogged. Awesome blog Allie, love you two so much! We celebrate with a date at Waffle House. Every year we do it, and it’s not fancy but it’s what we like… simple and easy and cheap too. Plus V-day is on a weekday and we don’t want to go downtown and deal with traffic and crowds after working all day. The bed looks great, it is so neat that Jimmy is making it too. And getting sushi for you was a really sweet gesture. That’s what Valentine’s Day is all about, nothing too fancy. I just love your Waffle House tradition!! It’s so unique and just awesome! 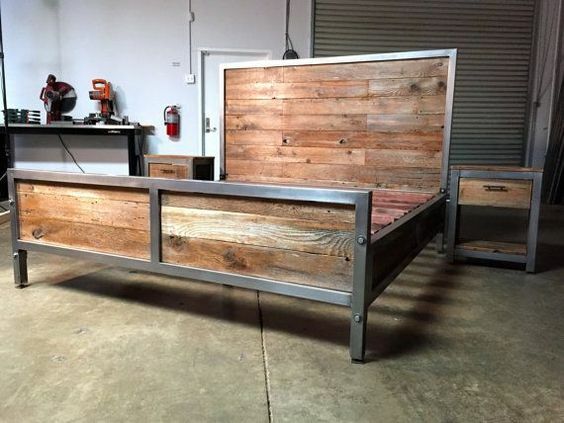 Jimmy’s start on the bed looks awesome! 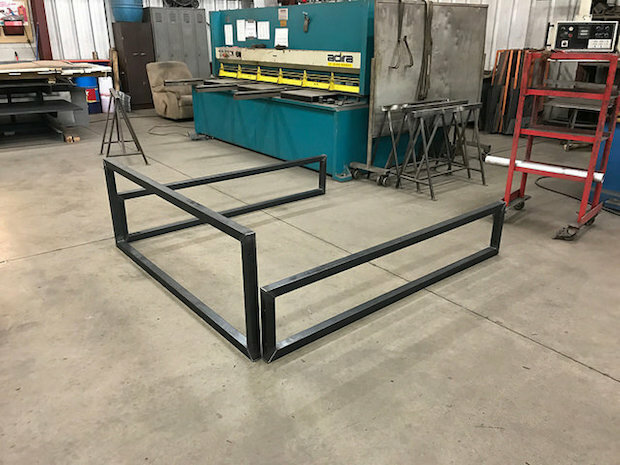 I can’t wait to see the finished project. I hope you’re feeling better today. Alex and I are celebrating Valentine’s Day this coming weekend which I’m excited about. We may have steak at home tomorrow but we shall see! I agree!! I can’t wait to see how it looks! I will make sure to post about it when he finishes! I am feeling a bit better, thankfully! I hope you and Alex had fun celebrating V-Day! Your husband is so talented and so sweet! There is so much good in this post. And Malcolm! What a card. You guys are definitely owned by him! You know, my cats growing up never jumped on the table. 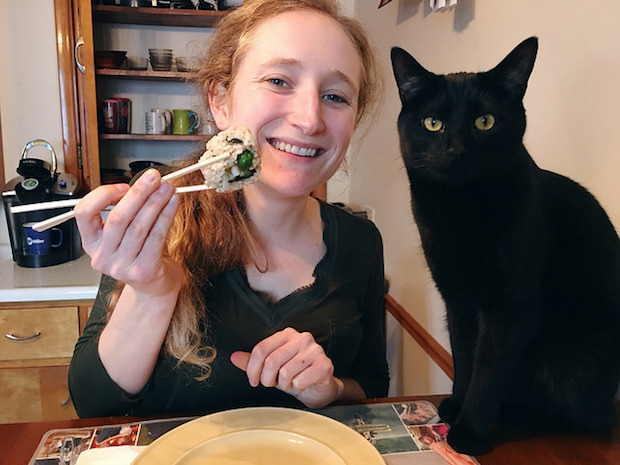 But when I’ve lived with roommates, all their cats do! Weird right? So funny! You guys must have laid down the law in the Pell house!! Happy happy Valentine’s Day, friend!! I’m so glad you guys had such a wonderful weekend celebrating together! Jimmy is such a sweetie for spoiling you so much this Valentine’s. I’m excited to see your bed once it’s all finished!